Combine all the ingredients in a bowl and mix well. Add sufficient water to prepare dosa like batter. Keep it aside for 10 mins. Heat a tava or frying pan. Grease it with oil. Take a ladle full of batter and pour on the tava. Let it spread like a rava dosa. Apple oil all over the sides. Turn on the other side once it is cooked. Once done with the cooking, remove from the tava and keep aside. Repeat the same procedure. Serve hot with any chutney. 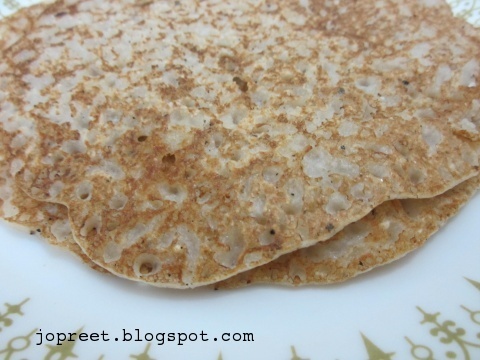 Very healthy dosa…mine is different one..will try this way soon.. This is a healthy breakfast..will make it. Simple but very healthy one! Love it. Crispy and healthy dosa. I too do this same way. Fedup having oatmeal for breakfast….this recipe sounds good. Will make it tomorrow for Bfast. Thanks for the recipe. 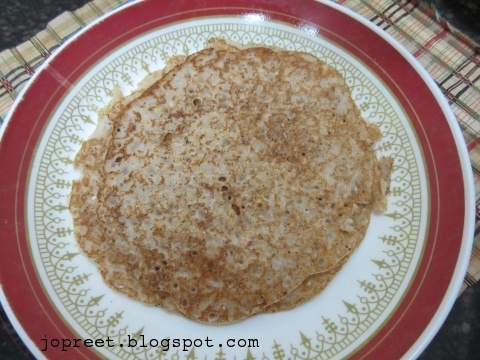 Oatmeal is a great replacement to make dosa! looks delicious!